Is celebrating New Year’s Eve high on your boomer travel list? Usually, Alan and I quietly ring in the New Year at a neighbor’s house to avoid drunk drivers or spending a long evening in a crowded ballroom or restaurant with strangers. But I have a secret New Years Eve wish. I’ve always dreamed of a gala celebration at sea with a chance to dress up, dance after dinner and clink champagne glasses at midnight with friends we’ve come to know on the cruise. New Year’s Eve 2011, I finally checked that travel goal off my boomer bucket list when Alan and I cruised through the Panama Canal on Silversea’s Silver Cloud. The night began with a cocktail party in the Venetian Lounge (Silver Cloud’s theater) followed by Abbalicious — a pre-dinner show performed by the Silversea Artists. This talented group of singers (3 males and 3 females) belted out songs by ABBA, delighting the international clientele on board and setting an energetic tone for the evening. Dinner choices included a formal dinner dance in The Restaurant, La Terrazza (Silver Cloud’s intimate, Italian dining venue) or the comfort of your own suite. I’m sure that you’ve already guessed that the formal dinner dance in The Restaurant was our New Years Eve choice. 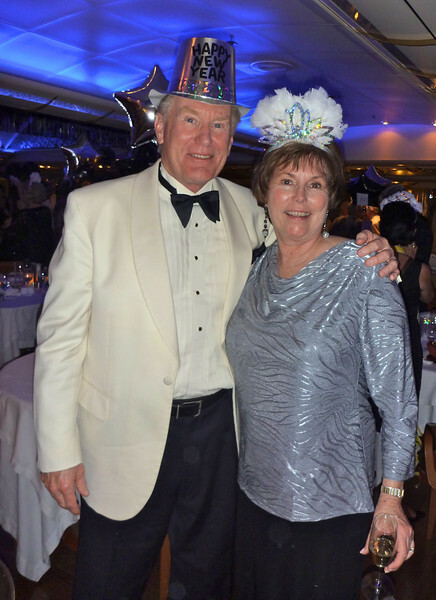 After Alan donned his top hat and I placed a feathery tiara on my head, we walked through the black and white balloon arch into The Restaurant for the beginning of a festive event with our friends and travel companions, Jack and Sue. 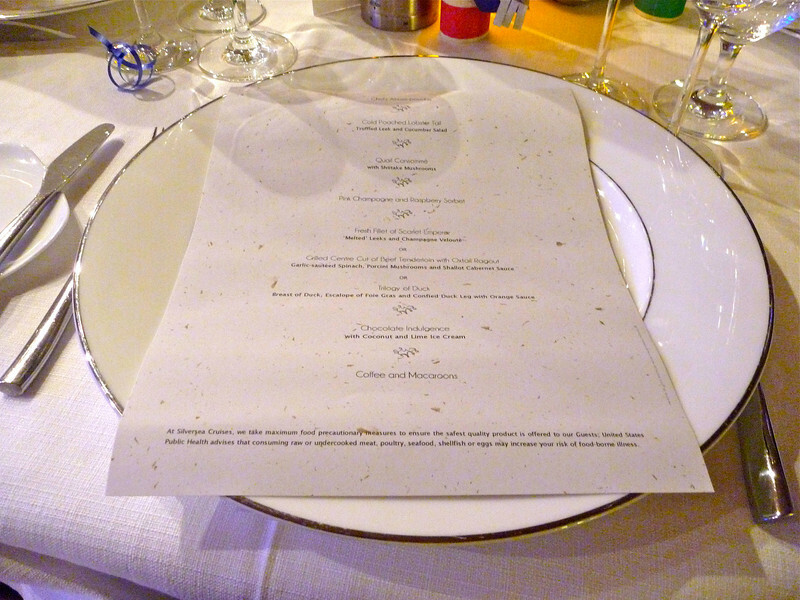 At table 24 (our pre-reserved headquarters for the night), we unrolled the dinner scroll to discover a six course menu that included entree choices of beef tenderloin, fish or duck. The house band played ballroom favorites for dancing during the long meal. Members of the Silver Cloud entertainment staff also sang musical numbers to entertain us interspersed with the announcement of raffle prizes that included spa and casino certificates. The grand prize of a $1000 certificate off a Silversea cruise was announced right before midnight. Drats! We didn’t win. The only downside to the evening was a dropped dinner order. At 11:30 p.m., our group realized that the rest of the room was finishing dessert and we hadn’t received our main course. It finally appeared with just enough time to finish before the real festivities began. Almost time to toast the New Year on Silver Cloud. The staff distributed champagne-filled flutes before the big countdown when black and white balloons were dropped from the ceiling to much toasting, hugging and kissing. When the band played Wooly Bully from Sam the Sham and the Pharaohs, I knew we were in for some boomer dancing fun. 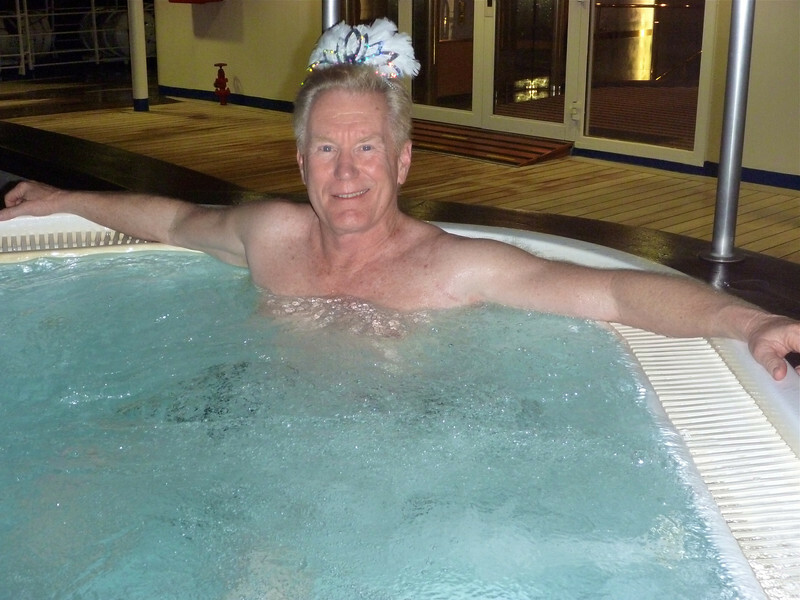 Later, we ended the night with a soak in the hot tub where Alan and I exchanged hats. Boomers need to have a little fun, right? Don’t you think that Alan is a good sport for agreeing to publish this photo? Overall, the Silver Cloud staff did an amazing job with food, decorations, service and entertainment. They certainly deserved their own celebration in the crew bar. 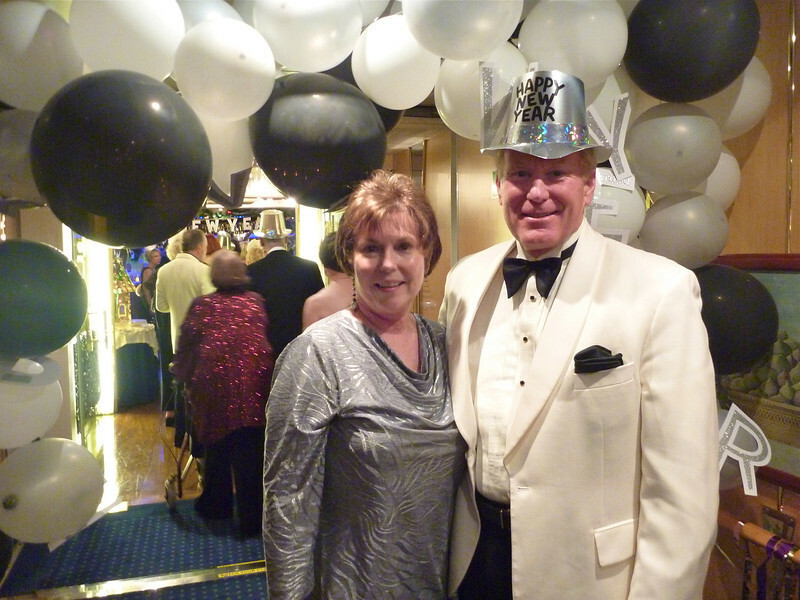 Have you celebrated New Year’s Eve on a ship? Join the conversation at the My Itchy Travel Feet page on Facebook or send us an email to ask a question or share your experience. 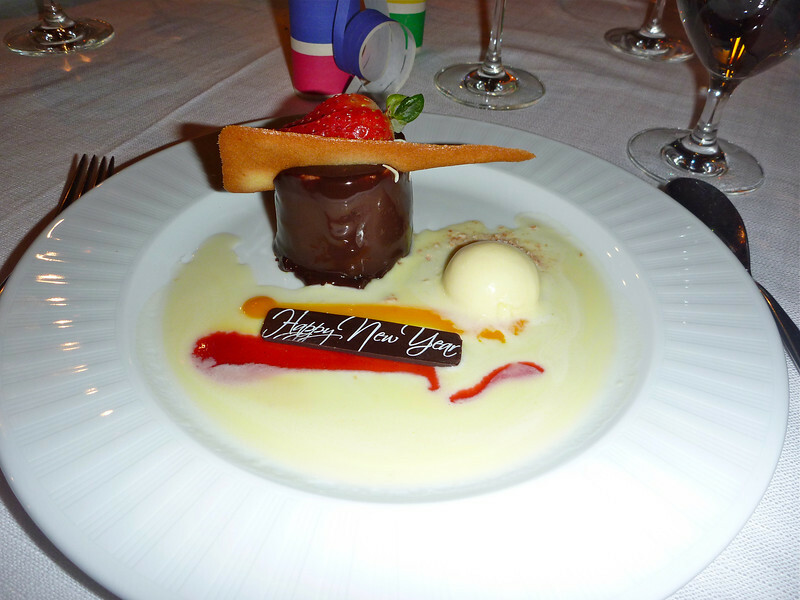 To see more of our New Year’s Eve celebration photos on Silver Cloud, visit the My Itchy Travel Feet page on Facebook. Be sure to like us while you’re there! Saturday’s scene: What’s On Your Boomer Bucket List?